Andrew Sonn was the assistant vice president of academic support services before being tapped to lead the parent services office last week. He has spent 16 years at GW. 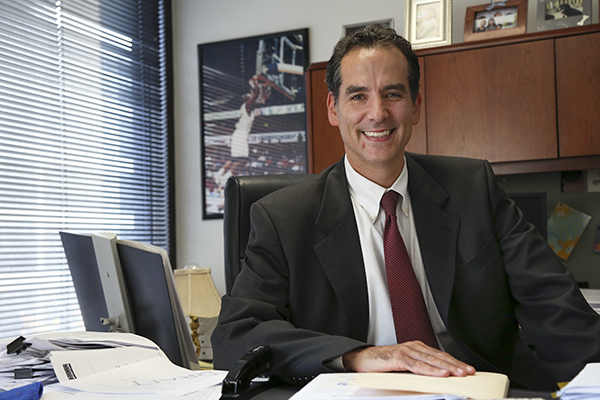 The new director of GW’s parents office worked his way up from student to top administrator. Andrew Sonn, the new director of the Office of Parent Services, aims to engage and educate parents in his new role. With 16 years of experience at GW under his belt, Sonn has experiences as an administrator and faculty member, working first with students and now with parents. He said educating parents on how to help their students before they arrive at GW is key, and said he wants to work to make communication consistent from when students receive their acceptance letters to when they receive their diplomas. Sonn was named to the position last week, about a week before parents’ weekend, after the office’s former head left in July. “The research shows it’s really important for parents to foster students autonomy, resilience and grit because that will really help students achieve in college and then after college,” Sonn said. Sonn said his priorities as director of parent services are divided into three “buckets”: education, engagement and assessment. He said he plans to further involve parents in students’ lives on campus and use them as resources. To help better educate parents about the details of GW as well as how best to adjust to their children being in college, Sonn said he and his staff will update the parent services website and increase communication with parents. “My philosophy is that it’s really important that parents can navigate the differences between high school and college,” Sonn said. He added that in-person conversations can be the best way to help college students and parents reach an understanding and transition from students living at home to on campus. “We’re all tethered to our smartphones. We don’t sit down and have good dialogue,” he said. Before Sonn took over as the leader of parent services, he served as assistant vice president for student and academic support services, where he oversaw international services, parent services and veteran affairs. He began his career at GW in 1999, as the director of housing. In 2010, Sonn graduated from GW with a doctoral degree in higher education administration, which he now teaches in the Graduate School of Education and Human Development. In previous roles, Sonn worked on the team that designed and implemented Colonial Central in the Marvin Center and helped expand GW’s office of veteran services. Sonn takes over an office that was led by its founding director Rodney Johnson for nearly 30 years. Johnson included parents in Colonial Inauguration for the first time and started a fund to bring parents to campus in case of emergencies. Sonn said he would use mechanisms like the GW parents email listserv to share conversations that parents should have with their students either before or during college. He said he plans to engage parents by making them feel comfortable bringing concerns to the Office of Parents Services. Sonn said it’s helpful to take advantage of times when parents are already on campus to bring families together and connect them to GW, like at this upcoming Colonials Weekend. A self-proclaimed “history buff,” Sonn said he’s excited about events at museums and Arlington National Cemetery during the weekend. “It’s having a two-way dialogue with parents and also telling parents how they can really support GW students,” Sonn said. He said he hopes to use parents as career connections for students, and encourage them to act as resources to GW students in general. Sonn has already started to evaluate other universities’ parent services offices to find other activities and resources that would work well at GW.